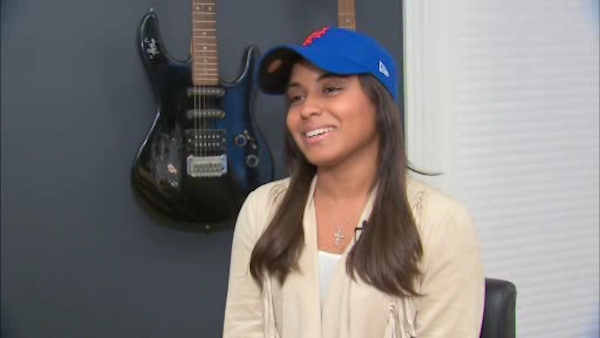 NEW YORK (WABC) -- 26 year-old Queens singer Josefina Sola, who performs under the name Fina, wrote a walk up song for Mets outfielder Yoenis Cespedes. It was an unlikely collision that has both of them counting home runs. Fina has been a Mets fan her whole life. "I live in Corona, so I can literally just walk through the park and get to the stadium," she said. Little did she know that World Series baseball might help her dreams come true too. Starting with a chance to sing the national anthem at the August 30 Mets game. That's where she met Cespedes. "Your walkup song is outdated," she told him, "and I think I can do a better one, I'm a singer. And he's like, 'really, OK, go for it." She did. The Corona crooner whipped up an all-star walk-up jam. Check out the song Fina wrote for Cespedes. During the first playoff game ever at Citi Field he used it. And blasted a 3-run homer. "It's your song, and I'm like, shutup! And then he hit the home run and they did the replay, and when they did the replay, and when they did the replay that's where you can really hear the song." Her new single was a hit. Fina used her own voice to share the song on social media and explain the lyrics. "So, The Power is La Potencia in Spanish, and that's what he was known for in Cuba and it's still his name now, which means the power. And I came up with that while process because he literally came out of nowhere and then just got the Mets up to whole 'nother position, they made the playoffs." She relates, saying she also is a person in New York City with dreams, using her "power" to make it happen. "I'm a girl from Corona who's living her dream and slowly reaching it," she said. "Nothing's impossible, work hard. You're in New York, we have the power here, go for it."